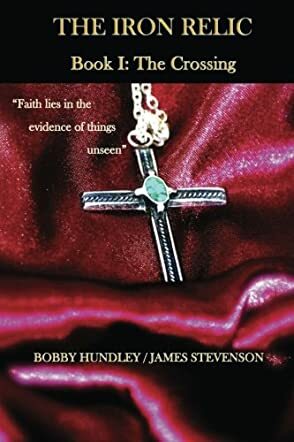 The Iron Relic Book I: The Crossing by Bobby Hundley and James Stevenson is a religious thriller. Adam Calhoun, a pediatric oncologist, is given a crucifix by his billionaire grandfather on his deathbed, with strict instructions not to tell anyone he has it, and to pass it on to the right person. Following Henry Calhoun’s death, strange things begin to happen. The crucifix is said to have the healing powers of Christ. Hidden inside it is the tip of one of the nails that pierced the skin of Christ on the cross. One of Adam’s patients, a young girl, is dying of cancer and requests a rosary for her passing over. Unable to find one, Adam gives her the crucifix and, the next morning, the girl appears to make a miraculous recovery. Adam starts a relationship with his grandfather’s doctor, Rose, and wants to confide in her about the crucifix. Before he can, his house is burgled and he is mugged by someone else who is after the crucifix. Adam is the hunted, but now turns hunter in a desperate bid to find out what is going on. Who is after him? And where does Rose fit in? The Iron Relic Book I: The Crossing by Bobby Hundley and James Stevenson was one of those “wow” books. The opening sequence took hold of me and left me unable to put the book down until it was finished. The story is fast paced with no dead spots, action all the way and some neat twists as well. I found the characters to be written in a way that made them easy to identify with, and the plot was easy to follow but with enough intrigue in it to make it worth reading. In one respect, I was a little disappointed with the ending, but, in another respect, it just makes me want to read book 2 even more. If that was the intention of the two authors, they have succeeded in their mission! Really looking forward to the next book and the next stage of Adam Calhoun’s hunt for the truth.